For some anglers, the thought of using slip bobbers seems like a boring concept. Akin to watching paint dry on the side of the barn. Throw the bobber out, let the bobber sit and wait… and wait until a fish swims by. While you can just sit and stare, you can also fish slip bobbers with a much more aggressive mindset and if you fish slip bobbers correctly, you are hustling and adjusting the entire time until bobbers start getting dunked. Slip bobbers can be so incredibly effective because of the precision involved. 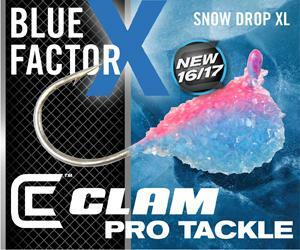 You can stick or drift through the “X” for long periods of time and let good live bait do the work. A lively squirming leech or flashy shiner struggling in place is too much for most walleyes to resist. Especially early in the season before the water warms up, slip bobber presentations are one of the best techniques for triggering shallow fish. While you can use a slip bobber in depths past twenty feet, they can really shine whenever targeting a specific piece of shallow structure that rises up from twelve to three feet of water. Shallow rock reefs or bars or any type of shallow structure that has debris on the bottom is a perfect candidate for the slip bobber presentation. Reason being is that you can slowly drift or work good live bait in front of the fish yet stay above snags or other debris that can ruin your presentation. Early in the season, off shore reefs, bars and rock piles that come up into shallow water are great locations. Other top locations include shallow structure that is connected to the shoreline. Shallow points, rock piles, submerged timber or emerging weed beds can all be worth checking. A favorite location of mine are inside turns or troughs where a little bit deeper depression cuts up tighter to the shoreline. Even on small spots, there are usually fairly small “spot on the spot” zones where most of the fish come. In some cases, there might be a school of fish holding on an exact tight location. Other times however, it often seems that fish pass through and over the spot and each pod of fish follows the exact same route and certain parts of the spot either funnel fish movements or stall fish as they cruise through. This is why slip bobbers often seem to create spikes in activity where the fish come in spurts. Each location seems to have specific zones where most of the fish come off of these small locations but what is interesting is that these “spot on the spot” locations can sometimes change daily on a specific piece of structure. How deep the fish are moving along with wind direction and underwater currents change this recipe daily. This is where the works comes in. Adjust depths and cover the spot with slip bobbers until a pattern develops. Let the slip bobbers drift through the zones and cover water. When the slip bobber is drifting at the correct speed, they will be standing straight up. If they are leaning, the line is too tight. When you get the fish dialed in, you will eventually keep the slip bobber in a much tighter zone and will have to reel up the bobber and let it back out so it keeps drifting back through the productive area. As you get dialed in, the spots get smaller but even when the pattern develops, I still like to take at least one rig and keep roaming and covering larger amounts of water just to keep on top of things as fish locations change especially if the wind picks up or backs down. In really strong wind, you will have to anchor so that the bow of the boat faces the wind for the anchor to hold but if you can anchor with two anchors and get the boat positioned perpendicular to the spot, you can widen the platform from which you fish which can help with slip bobbers because as the bobbers drift away from the boat or towards the boat, you want the slip bobber to drift to or away from the rod tip with a direct line of sight. Kind of like spreading out lines when you are trolling. You do not want bobbers crossing or the lines crossing. The rod in the front of the boat has to be pointed directly at a bobber out the front of the boat. This way as the bobbers drift, you don’t tangle lines and have lanes to fight the fish. When each bobber gets to the end of the productive drift, reel up and repeat. With multiple lines, especially with stronger winds or currents, this can keep you hopping. Slip bobbers are an extremely effective way for catching early season walleye. 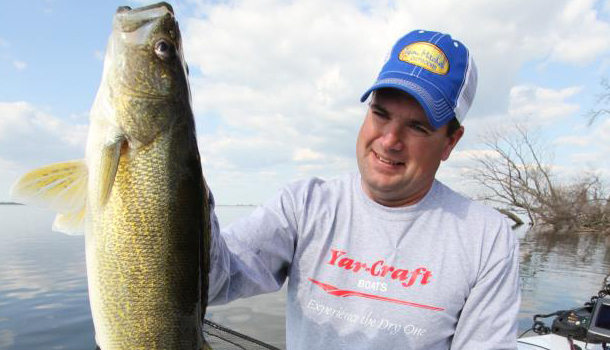 Pictured is author Jason Mitchell with a slip bobber walleye. Depending on where you fish, the main line can be either monofilament or braid. The advantage of using monofilament (8 to 12 lb. test for walleye fishing) is that the bobber stops grip monofilament very well. Some braids however work well for slip bobber fishing as well. I like to use 14 lb. Bionic Braid for the main line as it is extremely durable and if you leave a little tag end on your bobber knots and cinch them up tight, they hold on the braid decent. Below the sliding slip bobber, I like to add a small egg sinker and bullet weight and below the sliding weight, tie on a small barrel swivel. Why the sliding weight versus split shot? I find that I can pop the weights out of the nets faster and get back into the water quicker versus having a bunch split shot wrapping up in the mesh. Below the swivel, attach a snell of monofilament or fluorocarbon. Hook options include just a plain hook or small jig like the 1/32nd ounce Northland Fireball. Here are a few considerations and tweaks. Early in the season especially with larger swells, you can sometimes catch more fish by subduing the up and down action on the rig. You can accomplish this by using the heaviest weight possible (that doesn’t sink the bobber) and using longer snells up to four feet depending on the waves and go with a plain hook. This longer snell cushions and subdues the up and down action. I rarely use really light rigs and small bobbers as I feel the larger floats and heavier weights give me a big advantage. Reason being, the rig drops down into the zone immediately and allows for more precise fishing where I don’t have to wait for the rig to pull line through the bobber and don’t have line blowing around above the water. The set up time is extremely fast. If you are drifting over rocks or boulders, use a small lead head jig and tie on with a Palomar knot. With the knot cinched tight, bend the jig down so that the hook is facing down with the bend, instead of riding horizontal. This modification will allow the jig to ride over and through rocks a little better. When using plain hooks, don’t hesitate to hook the leech through the middle of the body for more swimming action. With minnows, you can sometimes get them to swim harder by just hooking them through the top of the mouth versus both lips. Reverse hooking through the hide under the dorsal fin also works well but the minnows don’t cast well with that hook placement. Slip bobbers just plain work well especially early in the season. With high gas prices, sitting on key spots is not all bad. This presentation is a guide’s dream because your boat control is simple and you are free to interact and tend to the people in the boat. When a bobber goes under, set the hook with the reel. Crank on the reel handle until the rod loads and then sweep. You will catch many more fish by getting a good connection because remember there are times when fish swim towards the boat. Slip bobbers have always been extremely regional with strong followings amongst anglers on a few noteworthy fisheries like Mille Lacs and Devils Lake but slip bobbers can be extremely effective on many fisheries and the results are the same. Stick good bait in front of fish and you are going to catch fish. 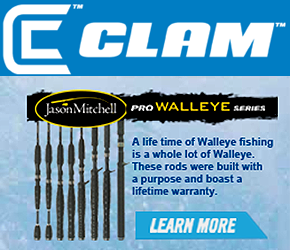 Editor’s Note: The author, Jason Mitchell is a renowned walleye angler who hosts the outdoor television program Jason Mitchell Outdoors. Jason Mitchell Outdoors airs on Fox Sports North and Fox Sports Midwest weekend mornings. More information on Jason Mitchell Outdoors can be found online at www.jasonmitchelloutdoors.com.